Hard-line conservative Republicans in the House recently hit a roadblock in their effort to impeach Deputy Attorney General Rod Rosenstein when Speaker Paul Ryan opposed the move. But one of those conservatives, Rep. Devin Nunes of California, gave a different explanation to donors recently when asked why the impeachment effort had stalled. He said it's because an impeachment would delay the Senate's confirmation of Judge Brett Kavanaugh to the Supreme Court. 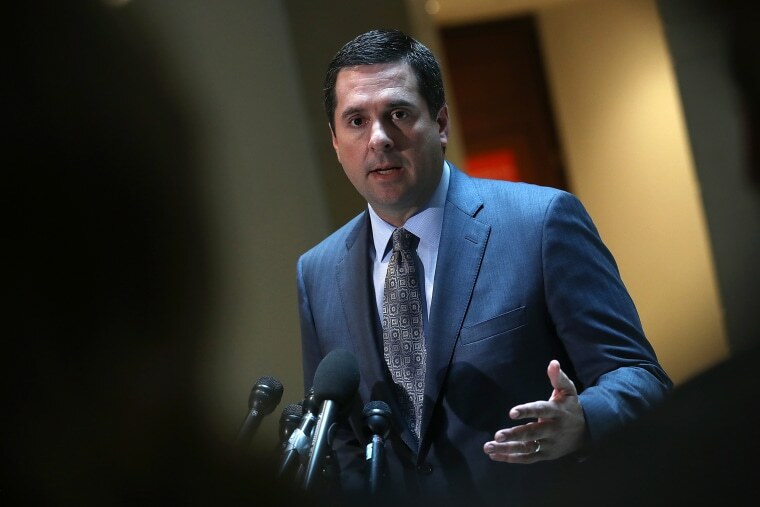 Nunes, chairman of the House Intelligence Committee, made the statement in an audio recording surreptitiously made by a member of a progressive group who attended a Republican fundraiser on July 30 in Spokane, Washington. The recording was obtained by "The Rachel Maddow Show" and was played on MSNBC on Wednesday night. Asked about the the impeachment plans, Nunes told a questioner that "it's a bit complicated" because "we only have so many months left." Conservative lawmakers have accused Rosenstein of trying to stymie congressional oversight of special counsel Robert Mueller's investigation into alleged Russian interference in the 2016 presidential campaign. The audio of the Spokane fundraiser was obtained by the Maddow show from a member of the "Fuse Washington" progressive group who paid the $250 fee to attend the dinner. The event was a fundraiser for Rep. Cathy McMorris Rodgers, R-Wash. A spokesperson for her campaign had no comment on the recording and Nunes' office didn't return calls for comment. On the evening of July 25, House Freedom Caucus chairman Rep. Mark Meadows, R-N.C.; Rep. Jim Jordan, R-Ohio; and nine co-sponsors introduced a resolution to impeach Rosenstein. It does not have the support of the House Republican leadership. Conservative lawmakers have accused the Justice Department of trying both to tar President Donald Trump with the Russia investigation and to downplay the investigation into Hillary Clinton's use of a private email server when she was secretary of state. The Senate has only a few months to confirm Kavanaugh to the Supreme Court if they want to do it before the November midterms. Attorney General Jeff Sessions has recused himself from any probe into Russian election interference. Rosenstein appointed Mueller in May 2017 to investigate Russian interference in the 2016 election and other matters after Trump fired FBI Director James Comey. Nunes also said that "if Sessions won't unrecuse and Mueller won't clear the president, we're the only ones. Which is really the danger," according to the audio. "I mean we have to keep all these seats. We have to keep the majority. If we do not keep the majority, all of this goes away," he added, apparently referring to keeping Republican control of the House in the 2018 midterm elections. Nunes also appeared to say that if a campaign received and released stolen emails from a foreign government — he used a hypothetical example of McMorris Rodgers getting secret information from Portugal, where his ancestors are from — there would be a criminal element to that. "But ultimately let's say the Portuguese came and brought her some stolen emails. And she decided to release those. OK, now we have a problem, right?” Nunes said. "Because somebody stole the emails, gave them to Cathy, Cathy released them. Well, if that's the case, then that's criminal." No information has been publicly released from the Mueller probe that anyone in the Trump campaign was involved in the dissemination of stolen Democratic emails during the presidential campaign. Trump has repeatedly denied that any collusion took place between his campaign and Russian operatives and has called the Mueller investigation a "witch hunt." CORRECTION (Aug. 10, 2018, 1:52 a.m. ET): An earlier version of this article misstated the state Rep. Mark Meadows represents. It is North Carolina, not South Carolina.